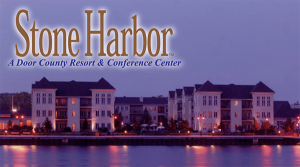 Hotel: A limited block of rooms are available at Stone Harbor Resort for SCBWI members at the special rate of $99 per night. Please call the hotel directly at (920) 746-0700 to reserve. Mention Write On Door County for the discounted lodging rate. Lodging is optional and is NOT included in the cost of the luncheon. Additional lodging options: White Lace Inn, (920) 743-1105, is approximately four blocks from Stone Harbor Resort. Other nearby accommodations include the quirky Holiday Music Motel, (920) 743-5571, and the Inn at Cedar Crossing, (920) 743-4249, a bed and breakfast with full restaurant and bar. Chain motels in the area, but not within walking distance, include Best Western, (920) 743-7231, Super 8, (920) 743-9211, and AmericInn. (920) 743-5898. Again, please note lodging is optional and is NOT included in the cost of the luncheon.